Toyota’s current Prius is not the prettiest vehicle on the road, and I can’t decide if the styling changes made for the new Prius Plug-in have made matters better or worse. It certainly looks futuristic, particularly in the vibrant Aqua blue that’s unique to the plug-in model. 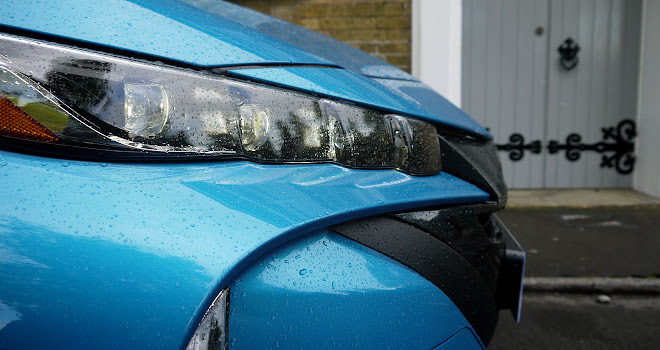 At the front, narrow quad LED headlamps provide a spider-like squint, while around the back the lesser Prius’s red squiggle tail lamps have been replaced with a more horizontal arrangement, with indicators mounted in vertical slashes beneath. Rear wash-wipe has been lost, because the tailgate glass has been reshaped into a curvaceous double bubble that would be tricky for a wiper to follow. The wheels are 15-inch alloys finished in smart grey, shod with 195/65 Bridgestone Ecopia eco-biased tyres. I learned via the helpful Wiltshire Tyres website that these have a B rating for economy (tyres with the top A rating remain a rarity) and cost under £60 a corner to replace. 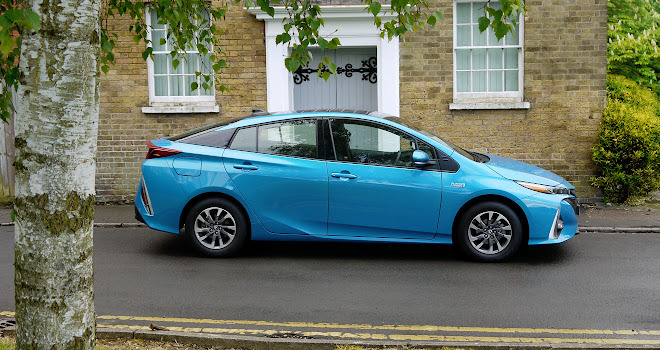 On today’s fourth-generation Prius, 15-inch wheels shave off a worthwhile 6g/km of CO2 compared to the 17-inch alloys, with a corresponding improvement in fuel economy, so it’s no surprise to find that the Plug-in has been fitted with the same size. However, some buyers may be disappointed to learn that in contrast to the ordinary Prius, the wheels of the Plug-in can’t be upgraded. Happily, the Plug-in enjoys a 22g/km official CO2 rating, which will lop 4% off the taxable rate for company car drivers compared to the plain hybrid’s 70g/km. 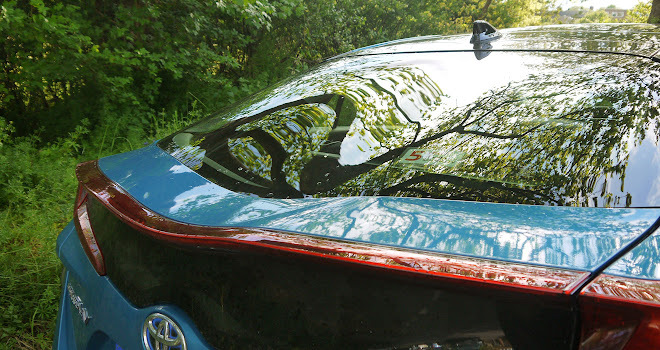 The Prius Plug-in has been subtly stretched compared to the hybrid version, by 2.5cm in the nose and 8cm in the tail. 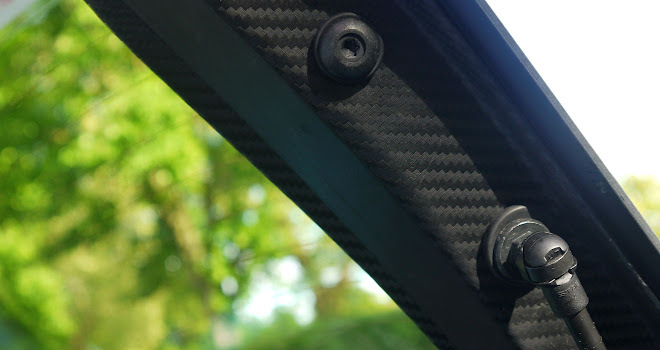 Pleasingly (in weight terms if not from a cost perspective) the longer tailgate has been fashioned in high-tech carbon fibre that you can admire every time you open the boot. The change in proportions presumably helps the car slip cleanly through the air but it also provides a bit more length to accommodate the large mains-charged battery mounted over the back axle. With a capacity of 8.8kWh, the lithium-ion battery is a bulky, 120kg chunk of hardware. Overall, the Plug-in weighs about 150kg more than the hybrid at just over 1.5 tonnes. The battery does make itself noticed, with the rear-end flicking up over speed humps like an agitated kangaroo’s tail. And while the standard Prius doesn’t have a deep boot, the plug-in variety has a luggage compartment as shallow as a saucer. 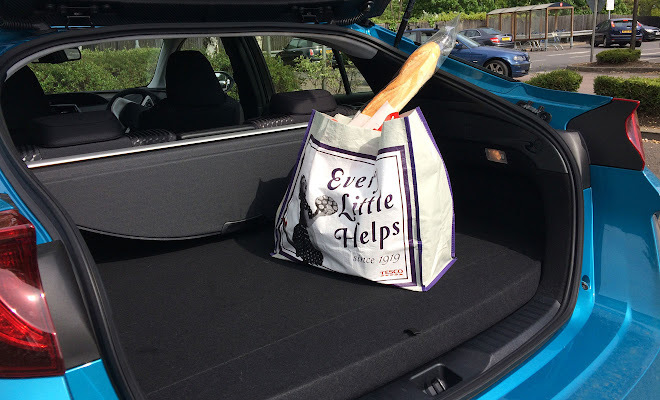 You can forget slipping your shopping under the rollerblind cover even if you haven’t got a baguette sticking out of your bag. At just 360 litres, about a hundred less than an ordinary Prius, the boot is probably the most compromised part of the car. Even the apparently helpful compartment at the rear, designed for stowing the car’s two charging cables (one with a mains plug, the other for wallboxes) doesn’t seem to be quite big enough for the job. Jamming the thick cables and their bulky connectors back into the narrow slot took me about five minutes and felt like solving a Chinese puzzle. Hopefully it gets easier with practice. 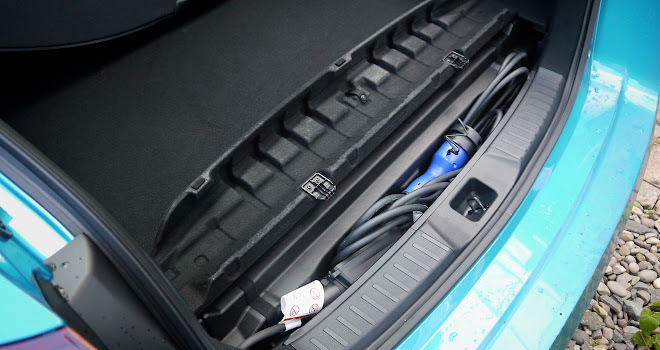 Another covered compartment at the side of the boot contains an emergency re-inflation kit – unlike an ordinary Prius, there’s no option to carry a spare wheel. 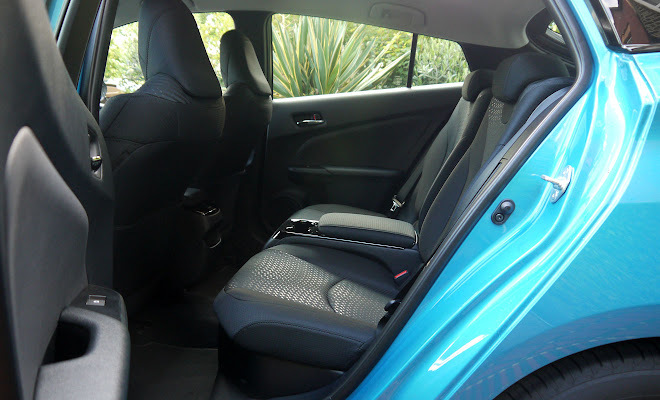 You might also be disappointed to learn that the Prius Plug-in is a strict four-seater, featuring a central armrest complete with storage cubby and cupholders in the middle of the rear bench, rather than a third seat. Reduced seating is apparently a weight issue – with the hefty battery permanently aboard the potential for five adults plus luggage would be too much for the chassis to safely handle. Two trim levels are offered, called Business Edition Plus and Excel, starting at £29,195 and £31,395 respectively, after the £2,500 reduction provided by the Plug-in Car Grant. For an extra £1,500 you can add a solar-panel roof to the Business Edition Plus, though it’s not available for the Excel. 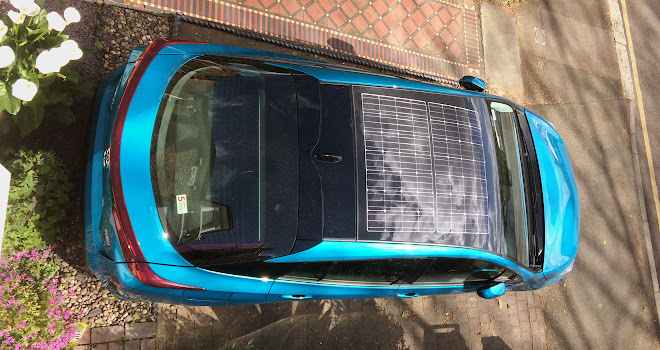 For poorly explained reasons, adding the solar panel removes the car’s head-up display, blind spot monitor and rear cross-traffic alert (the latter a safety system designed to keep an eye out when reversing). Toyota says the solar roof can add up to three miles per day, so I was keen to assess whether this might be true only in Death Valley. During my week with the car, in late April in the South of England, the weather varied from heavy overcast to bright spring sunshine, and I saw an average of two miles a day added to the car’s battery range prediction. That was better than expected, though given the price of the solar roof I doubt it’s a particularly wise investment. If you can afford it, the roof does add a big dollop of feel-good factor and is certainly a talking point – several friends and a couple of complete strangers quizzed me about it. Results may depend on the orientation of your home. My usual parking spot happens to be south facing, enjoying the best of whatever sunshine the British sky is prepared to provide. If the house were the other way around, I doubt I’d have collected two miles of sunshine per day. Inside, aside from restricted rear seating, the Prius Plug-in feels almost exactly like the standard Prius hybrid. 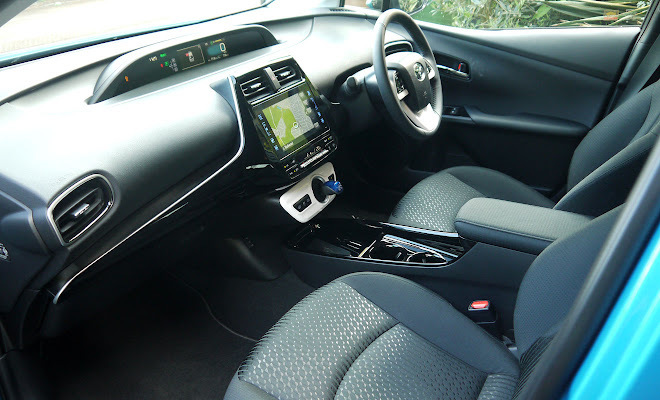 There’s the same quirky interior layout, with instruments in a centrally mounted digital pod, the same spring-loaded gearstick wand, the same foot-operated parking brake and the same bisected view out through the rear-view mirror. An 8-inch touchscreen with navigation is a much more welcome feature. As with the standard Prius, road-sign recognition in the instrument panel that ought to be helpful proved untrustworthy, several times spotting “90” speed limit signs on the backs of foreign lorries. I also had issues with the car’s adaptive cruise control, which several times lost track of the vehicle in front and switched itself off. It seemed prone to this failing in heavy motorway traffic – the very time when it ought to be most helpful. Those few problems aside, everything worked with Toyota’s usual efficiency. The car’s readout predicted 30 miles with a full battery and duly delivered 30 miles in EV mode (with caveats – you have to switch the aircon off and drive pretty carefully in Eco Mode to reach 30 miles, but it can be done). If you switch on the climate control the battery range shown will drop by about 7% (creating a mismatch between the prediction in the instrument panel and the prediction via the touchscreen, which foxed me at first). The heating can be applied to the driver’s position alone, has its own eco mode, and includes a clever advanced heat-pump design for maximum efficiency when the engine isn’t warm. Seat heating is also handy, though the heater switches are buried in the depths of the centre console and it took me three days to spot them. The car always wakes up in battery-powered EV Mode and will spend the mains charge straight away unless you tell it otherwise. Switching into Hybrid Mode, via buttons next to the gearstick, will preserve battery charge at roughly its current level. This allows you to save pure electric miles for the end of your journey if you prefer. 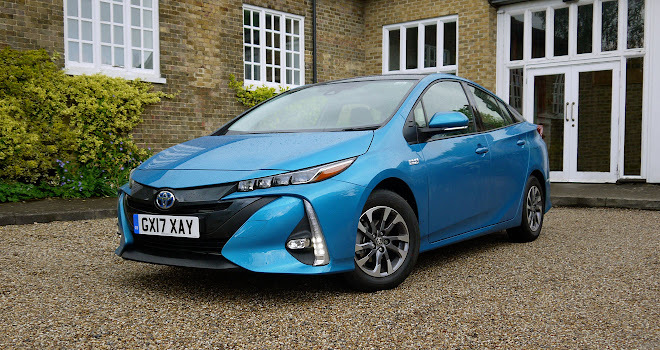 When running on electric power alone the Prius Plug-in remains lively and responsive to drive and can maintain ordinary motorway speeds without issue – the engine isn’t needed unless speed rises above 84mph. When the battery meter drops into its reserve charge segment, the engine will start up irrespective of speed. 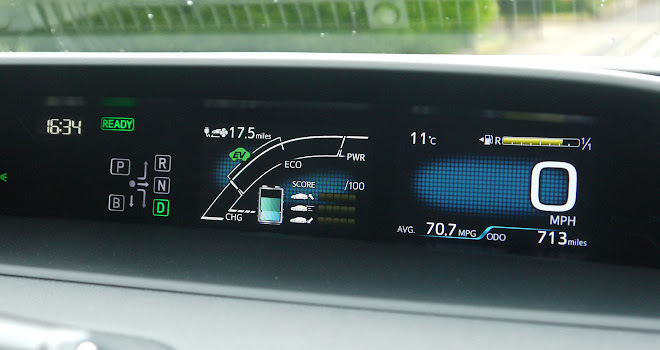 As with the standard hybrid Prius, the Plug-in’s engine will often work harder than expected and then switch off for a time, as the car’s computerised systems try to get the most useful energy out of every drop of petrol. 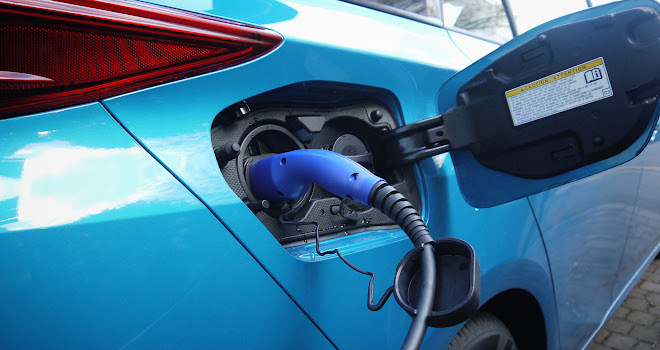 A moderately hard worked engine is more efficient than a lightly used one, so Toyota has set up the car to charge the battery opportunistically when demands on the engine are low. The stored charge is then periodically put to use by switching the car into silent electric mode. As a result of this on-off cleverness I saw about 70mpg from the Prius on a 200-mile trip, without stopping to plug in and recharge along the way. That’s an economy result I think I’d be unlikely to match in any other plug-in hybrid. Extra sound-proofing has been added compared to the standard Prius, so the engine is never intrusively loud, and of course in EV guise the car is exceptionally quiet, producing only a pleasing electric-car whine. Driving sensations are of the numb and remote variety, though the car is easy to place accurately and feels reassuring enough on a country road, though an initial lack of bite from the brakes can be alarming until you adjust your expectations. As my week with the Prius Plug-in proved, Toyota has created a smooth, efficient and very economical plug-in hybrid EV. 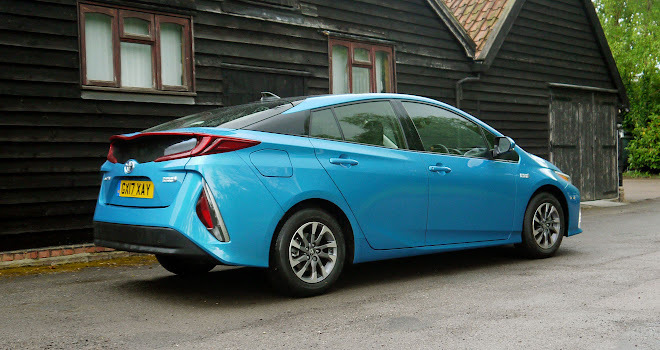 You would expect this second-generation to be better than the weak first-generation Prius Plug-in, and it is indeed a much better sorted and more persuasive machine. However, there is a big “but” to overcome. Costing £7,000 or so more than the standard Prius means the Plug-in must play in the £30,000 ballpark. Compared to other plug-in cars, it’s more expensive than a Volkswagen Golf GTE, roughly on a par with the entry-level Mitsubishi Outlander PHEV, and not far below a BMW 330e or Passat GTE. With just four seats and a shallow boot, Toyota’s plug-in can’t compete with any of the above in terms practicality. It will also tend to struggle in both driver appeal and kerbside kudos. However, on the plus side, the Prius Plug-in will likely trounce all other plug-in hybrids in real-world economy, particularly on longer trips.